The crankshaft converts the up and down motion of the pistons into a rotary motion. It provides the turning motion for the wheels. It works much like the pedals of a bicycle, converting up-down motion into rotational motion. 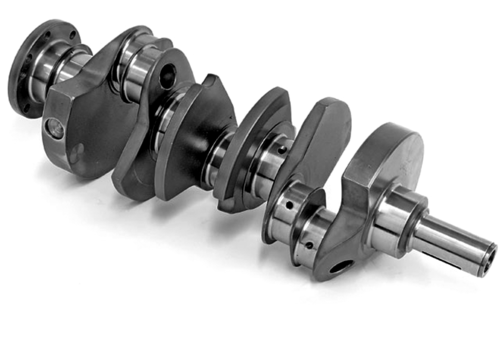 The crankshaft is usually either alloy steel or cast iron. The crankshaft is connected to the pistons by the connecting-rods. Some parts of the shaft do not move up and down; they rotate in the stationary main bearings. These parts are known as journals. There are usually three journals in a four cylinder engine.